Kristy Mathoslah is all smiles after floodwaters damaged her home in The Woodlands. Mathoslah found her wedding dress among her soaked belongings and decided to put it on, bringing smiles and laughter to everyone helping clean out her home. Kristy Mathoslah decided to have a little fun after Hurricane Harvey flooded her home. 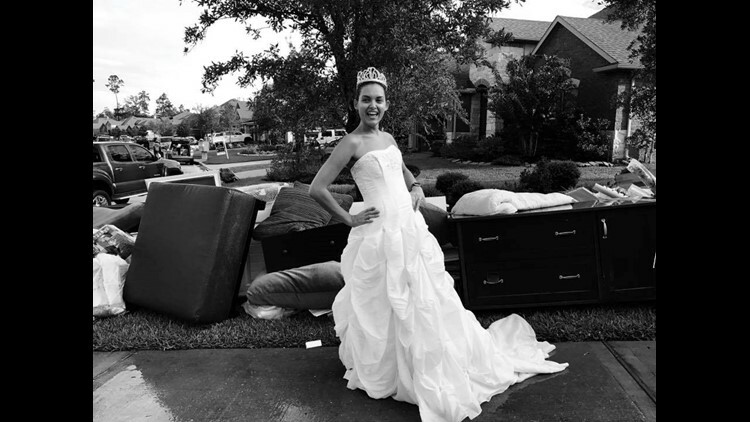 THE WOODLANDS, Texas – Standing in a white wedding dress outside her flooded home, Kristy Mathoslah is all smiles. Flood-damaged furniture and debris line her driveway as nearly a dozen volunteers—complete strangers—are inside her home to help anyway they can: rip up carpet, tear off baseboards and rid her home of her soaked belongings. Floodwaters had reached her now damp dress and Mathoslah—who’s been married to her husband, Konrad, for almost 12 years—decided to toss it. That’s when a woman helping had an idea: Why not put it on? The dress was wet, but sure, why not, Mathoslah thought. “We told her, ‘If you’re going to do this, you have to go all out. This is your last chance to play dress up,’” said Ivey Carroll, a volunteer helping clear out her home. Kristy Mathoslah with her "bridesmaids," the women who helped clean out her home. Kristy Mathoslah with her brother, Michael. Volunteers help rip out carpet in Kristy Mathoslah's home. Volunteers help clean out Kristy Mathoslah's home. Flood-damaged furniture and debris fills the outside of Kristy Mathoslah's home. She posed for pictures outside with her flooded furniture while wearing her daughter’s pink tiara. Her “bridesmaids,” the name she gave the group of women helping clean out her house, stood around laughing and taking pictures. A young boy across the street yelled, “You look beautiful!” People driving by stopped and waved, big smiles flashing across their faces. As neighbors in her Timarron subdivision began returning home to assess the damage Harvey caused, Mathoslah was a welcome sight to brighten their spirits. “It was the most fun I’ve had since this whole Harvey ordeal started,” Mathoslah said. Her family had to evacuate their home Aug. 27 as rain poured outside, flooding a ditch behind their home and overwhelming the neighborhood’s drainage system. When she and her husband returned, the water had climbed a foot inside their house, destroying nearly everything it touched: the carpet and walls, clothes and shoes, her family's photo albums and children's memory boxes. When Mathoslah and her husband returned to begin the cleanup process, she said volunteers arrived at their door unannounced to help. She received good news about her dress, too. A man who owns a dry cleaning company offered to clean it and preserve it. She won’t have to throw it away after all. As the sun set, Mathoslah and the volunteers, including Carroll who said she’ll never forget the day, drove away full of smiles in what should have been a somber day.